For business users this is perhaps the best choice here, but for someone who wants to use their laptop for play as well as work, there are better choices in the range such as the Core i5 powered version of the B570. The plain black chassis puts function firmly before form. The tough, ridged plastic withstands scuffs, and the firm lid protects the screen from damage. Although this isn't the heaviest laptop we've seen, at 2.4kg it's also not ideal for regular travel, although the 157-minute battery life can keep you working on short journeys. 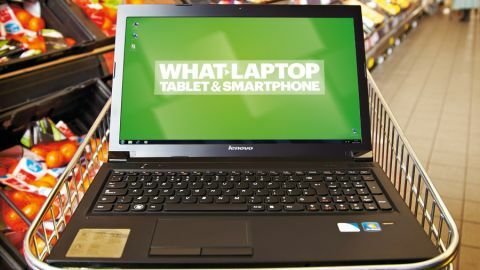 Lenovo's ThinkPad laptops are known for their great keyboards, and this quality has trickled down to its budget range. The B570's isolation-style keyboard features well-spaced buttons that move smoothly, quietly and accurately. The huge touchpad and mouse buttons are pleasing to use too, and the pad's textured finish makes it easy to find when typing. The wide design suits the screen's dimensions and enables you to scroll from one side to the other without removing your finger from the touchpad. The screen is a good one, and renders photos and videos nicely. Lenovo has gone with a glossy Super-TFT coating, so the colour reproduction is sharp with excellent contrast. As ever though, this kind of shiny coating is a double-edged sword, as you'll discover if you try to use this laptop in very bright light. The ageing Pentium processor still functions well, and helps to keep the price down. The CPU is backed up by 4GB of memory, which keeps programs running smoothly. It features an Intel HD Graphics card, but since it relies on the CPU the experience isn't comparable with a Sandy Bridge machine. You'll be able to manage the basics, but not 3D games or movie editing. This laptop's business credentials mean there are several useful security features to keep your files safe. A fingerprint scanner offers protection from unauthorised access, while pre-installed Lenovo software enables you to encrypt sections of the hard drive to keep files hidden. This might not be of much significance if you don't plan to use your laptop for business, but the extra security is a nice bonus. You also get a comprehensive selection of connectivity ports, including three USB slots, HDMI and VGA connections, and an eSata port that can double as a fourth USB. For connecting to the internet, there's the choice of Gigabit Ethernet or 802.11n Wi-Fi, plus Bluetooth connectivity. The B570 is a well built machine, and offers good value for money in terms of usability and performance. However, it's a tailored purchase more suitable for someone looking for a business or work laptop than a general purpose machine. This business-like approach extends to the design - jet black with sharp angles and a fantastic keyboard - perfect if you plan to be typing a lot of business reports, or using the numeric keypad for databases and spreadsheets. If those are your key buying criteria then you'll like the B570, but we feel there are better all-rounders out there.